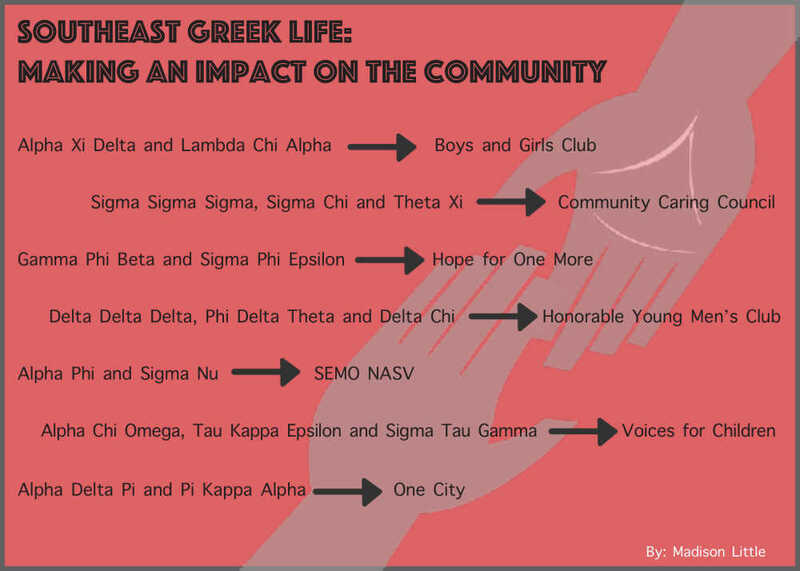 In efforts to connect more with the youth in Cape Girardeau’s community, chapter pairings in Greek Week are pushing their dollars toward local not-for-profit organizations rather than all proceeds going to United Way. Senior Zack Koeller, director of Greek Week, said he acquired the idea when thinking of ways to make a bigger impact on the community. “I wanted to focus less on the money raised and more on the impact we make,” Koeller said. He said it took a little convincing when he first pitched the idea to the executive board, office of Greek Life, Greek Week Steering committee and United Way but they were understanding and supportive in the end. “I had to explain the change to other campus administrators that, despite raising lots of funds on the past, we think this would allow us to make a stronger impact,” Koeller said. Associate vice president for Student Life Bruce Skinner said the new concept introduces the Greek community to more than just one group that receives their money; it will allow them to understand the specific missions of the not-for-profit organizations and want to raise more money on their behalf. Koeller wanted to create connections between the not-for-profits and the Greek houses, rather than just having the houses compete individually for points. The pairings for the week are: Alpha Xi Delta and Lambda Chi Alpha with Boys and Girls Club; Sigma Sigma Sigma, Sigma Chi and Theta Xi with Community Caring Council; Gamma Phi Beta and Sigma Phi Epsilon with Hope for One More; Delta Delta Delta, Phi Delta Theta and Delta Chi with Honorable Young Men’s Club; Alpha Phi and Sigma Nu with SEMO NASV; Alpha Chi Omega, Tau Kappa Epsilon and Sigma Tau Gamma with Voices for Children; and Alpha Delta Pi and Pi Kappa Alpha with One City. He said some of the pairings have already had the organizations contact them to continue to work with them after Greek Week is over. Koeller said the pairings work with the children, turning it into more of mentorship for them. “This is an opportunity for the children to be inspired by these students and possibly want to do the same thing one day,” Skinner said. Skinner said this year and last, they saw more involvement within the community for the blood drive, clothing and food drives, etc. Sophomore Rebecca Purcell, a member of Sigma Sigma Sigma, said their pairing hosted a hygiene drive for their not-for-profit, Community Caring Council, which allowed anyone to donate items and money. “We are more involved this year with more organizations being involved and it helps shine a light on all of these non-profits that do not get enough attention,” Purcell said. Koeller said challenges came with the idea of changing Greek Week. He said the not-for-profits, chapters, advisors and community members have had lots of questions regarding clarification on their mission, but have mostly been very excited to see Greek Life try something new. “In the end, it's not about the trophy or points but the impact that we are making,” he said.